The Lloyd District has always been a Portland outsider, an area that has never quite fit in with the rest of the city. That is slowly changing however, as the most suburbanly-spacious subdistrict of the central city is finally starting to fill in after a century of visionary missteps and shortcomings had left the area lacking the essentials of urban life. There have been small infill projects here and there since the city’s initial transit investment was put in place roughly 30 years ago, but only in the last few years has the district really started to transform itself. Coinciding with the Portland Streetcar expansion through the area in 2012, several of the Lloyd’s major landowners started to capitalize on the district’s largely underutilized potential by finally replacing their land banked swaths of surface parking with pedestrian friendly mixed-use developments. Two of these superblock developers, American Assets Trust (former Ashforth Pacific holdings) and Portland Lloyd Center Community Development (former Lloyd Center/ Regal Cinemas properties), have doubled down on their initial investments by both moving forward with phase II’s of their respective projects, Oregon Square and 1510 Multnomah, both of which look to further energize and urbanize the once lifeless and unloved district. This current developer-driven vision of the Lloyd is just one in a series of grand visions the area has seen in its lifetime, visions that have, for the most part, never fully lived up to their enthusiast’s expectations. Long before it was called the Lloyd District, the area was first known as Holladay’s Addition, named after stagecoach magnate Ben Holladay who originally developed the land. 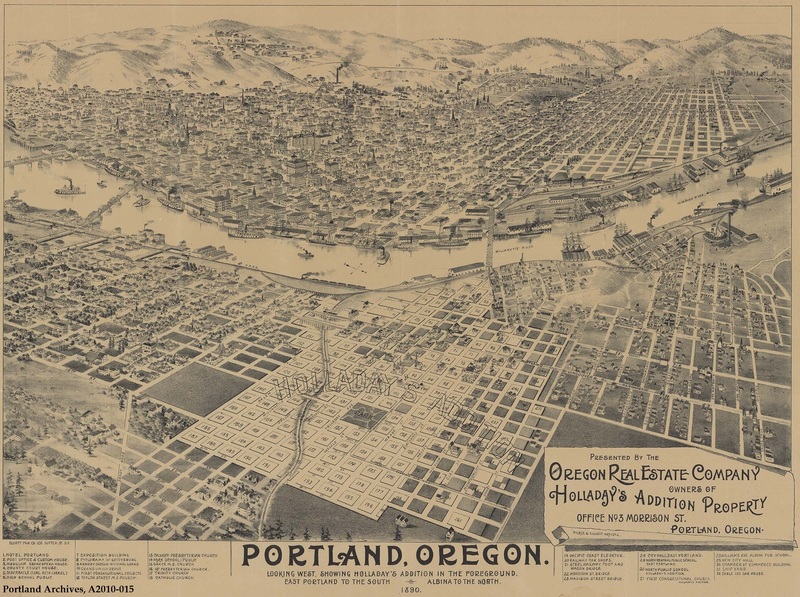 Unlike the majority of Portland’s early suburbs, Holladay refrained from building a streetcar line to his estates, a mistake that left most of his holdings vacant until long after his death in 1888. After Holladay passed, the fledgling suburb remained largely undeveloped and in ownership limbo for nearly three decades. There were two primary reasons noted for the lack of interest in Holladay’s Addition, one being the aforementioned lack of transit and the other being the impassable terrain of Sullivan’s Gulch that dissects the site, both of which made early access difficult. Homebuyers, at the time, were largely upper class folks looking for an escape from the hustle and bustle of downtown, and Holladay’s suburb could not compete for those affluent customers. With the lack of an easy commute to the central city nor connections crosstown, apartments for middle and lower class citizens never really materialized, neither did any commercial or civic buildings. The streets were plotted, but the people never came. As the story goes, Ralph Lloyd struck it rich in the second decade of the 20th century, when they discovered oil under his family’s ranch back in California. Lloyd, living in Portland at the time, had always dreamed of owning Holladay’s mostly vacant suburb, and with the wealth pouring out of his family’s estate, he could finally afford it. 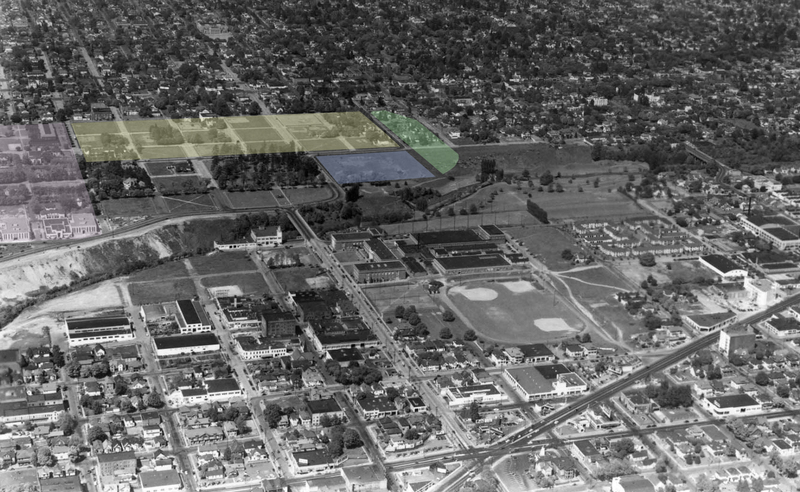 By 1926, Lloyd had achieved his goal, finally purchasing the majority of Holladay’s Addition, and set out to begin his long-held dream of relocating the city’s center to the eastside. The businessman was very vocal about his plans, noting that the region’s hub would be better situated on the Willamette’s eastern banks, on solid ground, away from the regular flooding and grimy street life of the existing downtown across the river. 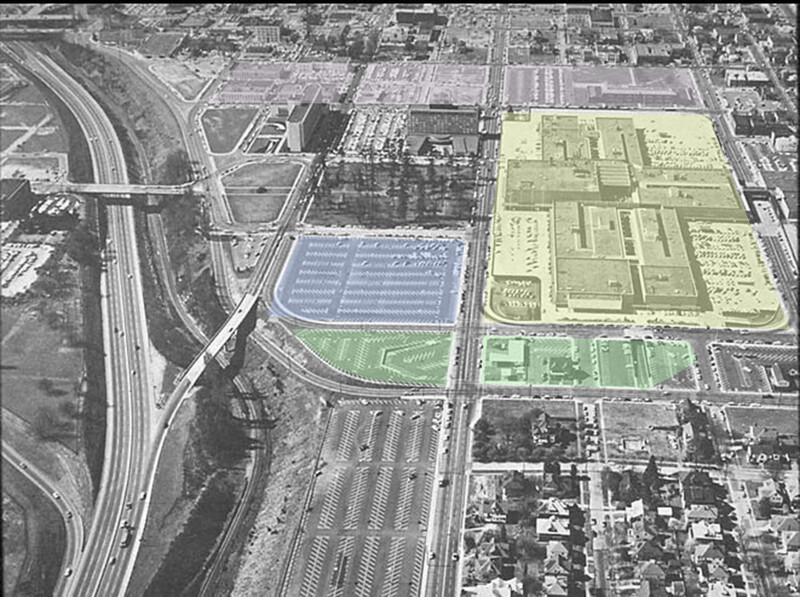 The vision included new office buildings, hotels, and shopping markets separated completely from multifamily housing, housing that would create a transitional buffer from his new downtown and the adjacent single-family suburbs. At the center of his plans, Lloyd proposed a grand civic center on what is now mostly American Assets property, complete with a new city hall, municipal buildings, and courthouses for every level of government. In order to do so, Lloyd razed many of the originally platted streets to create ‘superblocks,’ citing the need for larger buildings than the traditional 200′ x 200′ blocks could allow. He embraced the automobile as the future of transportation by widening his remaining streets and doubling down on Holladay’s insistence on not providing streetcar access. The stock market crashed three years later, and Lloyd’s grand dream came to a screeching halt. With oil money still flowing, he attempting to go at it alone, but soon found himself pushing up against a broke, uncooperative government while simultaneously getting entangled in lawsuits as he tried to buy out and demolish even more existing homes in that time of financial crisis. Ralph Lloyd died two decades later in 1953, leaving his sprawling collection of vacant property next to Sullivan’s Gulch undeveloped. The Lloyd family took up their patriarch’s vision however, and finished plans for a new hotel and shopping center that were to face Holladay Park. The family rebranded the area the ‘Lloyd District,’ as it had began to be called colloquially, and pushed for a more modest business district; one that would accompany the central city as a suburban-style wing of downtown. What really changed for the Lloyd family’s land, and made the vision viable, was not a change in leadership, but a change in accessibility. In 1955, two years after Lloyd’s death and four years before the construction of the Lloyd Center mall, the Banfield Expressway opened to traffic, allowing easy and direct access to the area for the first time. The city’s first freeway was incorporated into the federal Interstate Highway System a decade later, as I-5 and I-84 (I-80N at the time) joined together at the Lloyd District. Sullivan’s Gulch, once a hindrance to the area’s development, became the very reason for the district’s newfound success. The development that ensued created a sea of parking lapping around sporadic ‘towers in the park,’ all encircling an 18-block inward-facing, outdoor shopping behemoth: the utopian dreams of the 1910’s and 20’s Modernists became manifest. This suburban makeover of Portland was not as destructive as other parts of the city, due to the lack of existing development to displace, but the purposely anti-place characteristics of the Lloyd District seemed to forever taint the area as cold and uninhabitable; specifically designed as a place to pass through, but never linger. In the early 1980’s, the Lloyd District’s aura of misleading futurism fell out of fashion, and the city and mall’s owner needed to make some changes. With increasing crime and a decreasing number of visitors, the Lloyd Center underwent a Postmodern renovation, enclosing the outdoor mall and increasing its moviegoing offerings with a new cinema across Multnomah Street. The city finally added mass transit to the area with its first light rail line stopping several times in the district, and eventually starting building the Oregon Convention Center on its western border. None of these investments truly changed the overall feel of the sleepy district, having retained most of its dead spaces and anti-urban charm. Seeing the good times in the past, the Lloyd family started to divest its assets, selling large parcels to outside interests who then further divided the properties. Now that the district was primarily out of a single visionary’s hands, the area was finally ready to become urban. Urbanism has its roots in pluralism, something that movers and shakers like Le Corbusier, Robert Moses, and Ralph Lloyd never truly understood. The Lloyd District was unbound by its single-visionary leadership, and began to prosper, albeit slowly. The first changes came piecemeal to the Lloyd, but, in a somewhat comical reflection of history, it wasn’t until a group of local landowners and the city came together to build a new streetcar line through the district that things really started to take off. The stakeholders, after the early success of the pre-recession South Waterfront, saw potential in embedding rails to bring about a third Pearl District in development scope. 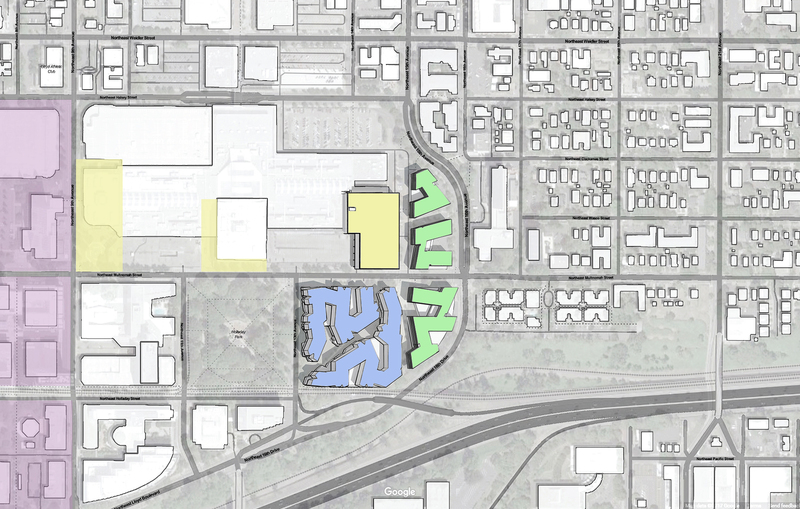 A new vision was laid out, centering around the last underdeveloped superblocks. Two of the largest landholdings were poised to make the greatest impact due to their location and potential scale: American Asset’s Hassalo on Eighth on the former Ashforth Pacific property and Portland Lloyd Center Community Development’s 1400 Multnomah on the former Lloyd Center Cinema parking lot. 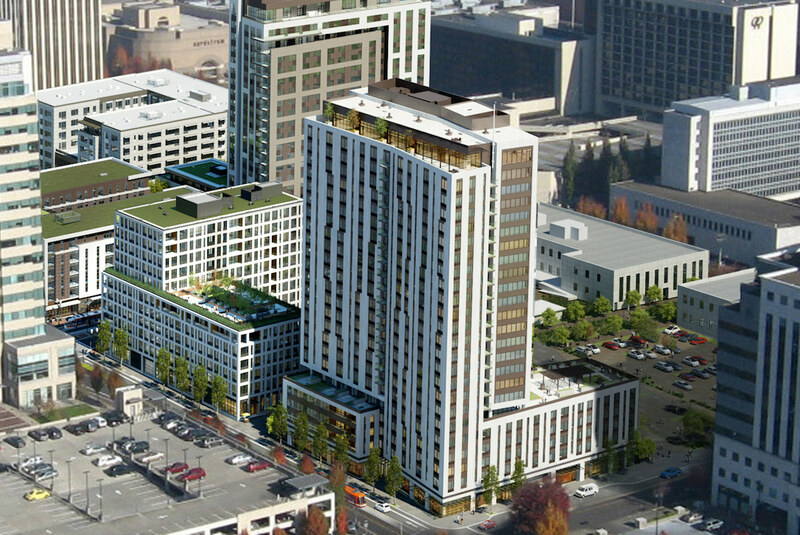 Both of these projects, Hassalo being completed and 1400 in for permit, are Portland’s largest single apartment developments, with 657 and 689 units respectively. Hassalo on Eighth was designed by GBD Architects and Place Studio, and was built as an ambitious first step in an even more ambitious three phase development. Because of the district’s history and local stigma, this project was a make it or break it deal for the grander scheme. The design team chose to reconnect the original street grid, marking out pedestrian alleys where swaths of parking once reigned. The multi-tower development was entirely mixed-use with differentiated and active ground floors, retail storefronts with indoor-outdoor environments, and staggered building forms to avoid spatial redundancy. The overall effect has been deemed successful, successful enough to jump start phase 2 (more on that later). 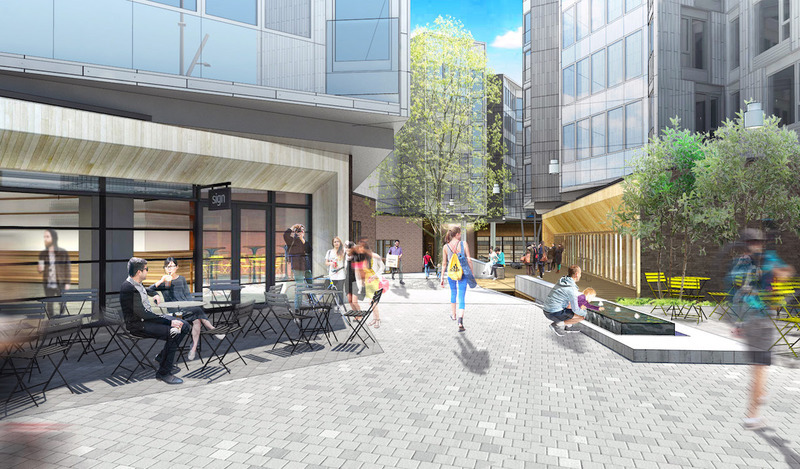 1400 NE Multnomah, a few superblocks away, is being designed by Holst Architecture and 2.ink Studio. Unlike Hassalo’s reserved architecture and material pallette, 1400 went bold with two Escher-esque tessellating building forms that interlock in a winding three-dimensional puzzle. Ignoring the 200′ x 200′ grid approach recommended by the city, the design team looked at this property with the immediate epoch in mind, and found that it would be best diagonally split by a pedestrian path for walkability, horizontally split for automobile and delivery access, and bridged over with a repetitious sleight of hand unit pattern that fits easily into a 5-over-1 shell. 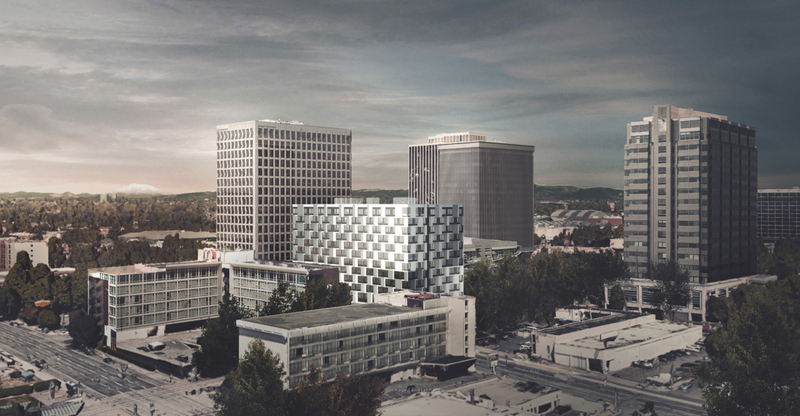 The uniquely-shaped program will contain 677 apartments, 12 live/work units, 37,780 SF of retail, 538 parking spaces, and 1,304 long-term bicycle spaces. 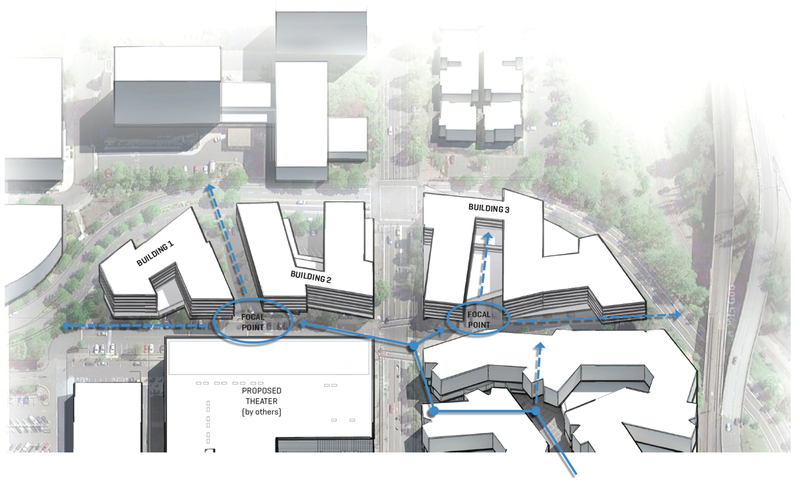 The real complexity of this scheme was designing an urban pedestrian alley and street-facing ground floor through and around such a repetitive form that could be both active and inviting year-round. Holst should be praised for detailing in such a convincing way, as designing such a large project within a limited budget and schedule is no small feat. The iterative process eventually passed Design Review with a few lingering hesitations from the committee, but Holst has a great track record for quality, conscientious design and this project, once built, should be nothing less than their standard. These two projects, along with other developments built or in the pipeline, are completely transforming the area’s sense of place. What was once Portland’s lifeless historic district for Modernism, is slowly becoming an actual neighborhood full of chance encounters and urban juxtapositions. Mind you, the Lloyd District still has a long way to go, in those regards, but the placelessness of the overall area is quickly disappearing. In the last few months, however, momentum has begun to change. Economic uncertainties surrounding apartment construction, new regulations, and a renewed interest in new office space has forced American Assets to adjust their already approved phase 2 project, Oregon Square. 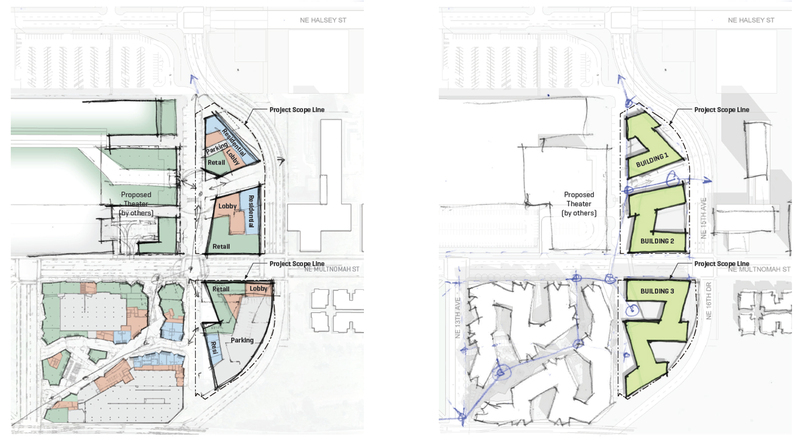 What was once a 904-unit, four-building superblock development surrounding a 200′ x 200′ internally-facing central plaza, has been scaled back to a two building scheme containing 619 units, 23,738 SF of retail, and a much smaller pedestrian plaza. While phase 1 of Oregon Square, which is phase 2 of American Assets overall three-part development, unfortunately looks to continue the reserved architectural language of Hassalo on Eighth, the design team at GBD does continue to excel at staggering building heights and introducing new fenestration patterns in order to differentiate forms, which is the biggest downside to 1400’s more contemporary, yet more homogeneous, architecture. Phase 2 of Oregon Square was officially put on hold pending phase 1’s apartment absorption rate, but several other factors should be noted that could potentially change all new developments in the Lloyd District. First, commercial vacancy rates are heading down, which may lead to new office tower construction, and second, the city’s new inclusionary zoning law is already having the predicted negative effect on residential construction. Phase 2 of 1400 NE Multnomah, known as 1510 NE Multnomah was preemptively thrown into simultaneous Design Advice and Design Review in order to be grandfathered in before the new rules took effect. The hastily created 1510 was presented as a direct continuation of 1400’s building form and massing, which created a grand rebuke from the design commission who already had reservations about previously approving 1400 due to its repetitiousness. 1510’s first iteration was for three 5-over-1 apartment buildings with a total of 520 apartments, 26,000 SF of ground floor retail, and 349 concealed parking spaces densely packed into two adjacent superblocks. While 1510 NE Multnomah is a long way off from becoming reality, the development team’s intention to retain a similar apartment layout with splayed ends, complete with the same 5-over-1 construction limitations, was laid out on the table and met with considerable resistance. While constrained cities like Paris create an urban richness within the limitations of a highly defined urban scale with concurrent time-honored character, The Lloyd District has no such datum or personality, and thus no such urban form to build off of nor play against. If 1510 were to continue the same dichotomous branching as it expands onto its neighboring parcels it would start losing its uniqueness and end up overwhelming its adjacencies. In the earliest massing models made public for 1400, 1510 was shown as a mix of towers and low-rises that better respected the city’s street grid. This was the form that the Design Commission was expecting to see, something with modulating heights and a different architectural language. Perhaps this is why even the best single architects or architecture firms have failed at making genuine ‘feeling’ urban spaces without having some variation or collaboration with others; there is something to be said about mixing creative thoughts, especially when it occurs over long periods of time… or, perhaps this is another prime example of developers attempting to push architects to keep repeating the same buildings over and over again for bottom line or perfunctory reasons. Regardless, the design team is sure to come back with a more differentiated and polished concept for the next go around. One of the greatest and least appreciated aspects of a public street grid, whether uniform (think Barcelona) or organic in nature (London’s Square Mile), is that private development can be easily altered to adapt to changes that occur over time. Suburban-style street layouts are incredibly difficult to alter, which is by design, e.g. single-family homes on private cul-de-sacs are near impossible to redevelop into denser or alternative uses. Regular city blocks and/or public-interfaced street design help maintain a place’s usefulness as an adaptable part of a greater whole. American Assets’ properties have already utilized this phenomenon to some extent: maintaining the Lloyd 700 Building while developing Hassalo on Eighth, and temporarily preserving Oregon Square’s low-rises while building out phase 2. Both 1400 and 1510, on the other hand, have been proposed as a singular development with only the current market conditions taken into account. Both also ignore the vacated 13th, 14th, and 15th avenues as well as Hassalo and Wasco streets that once ran through them, and realigning the semi-public private accessways and plaza spaces to current built conditions (adjacent building lines) instead of the more permanent public (adjacent streets alignments) or natural conditions (topography of Sullivan’s Gulch). With so much interconnected stitching occurring within each superblock, weaving buildings and irregular outdoor spaces, the current program might preclude future alterations, adaptations, or additions. More than likely these buildings will endure a long, useful life however they end up being designed, again, Holst has a great track record, but there is a pragmatism to thinking beyond the immediate concerns of today for those of adaptability for tomorrow. Meanwhile, across the street, the elephant in the room still retains its prominence in the Lloyd District, the 20+ acre Lloyd Center Mall. The once outdoor, now indoor mall has been facing the same slow death spiral that is facing most shopping centers in the United States, invest to make improvements or die. Many malls had to shut down during the Great Recession, others have attempted to adapt by creating a more urban experience. Sometimes this means redeveloping underutilized parking lots into residences or offices, as Lloyd Center is doing by selling off the Regal Cinemas lots, to create more localized foot traffic to offset disinterested suburban shoppers and online competition. If indoor shopping continues to decline, malls like the Lloyd Center could eventually be forced to shutter, which, on the upside for the landowners, has the potential to become the single biggest redevelopment project in the central city (zoned CX Central Commercial, 6:1 FAR, 225′ height limit). For now, however, the mall’s management is opting for minor cosmetic improvements inside and out, and have hired Waterleaf Architecture, famous for such architectural vomit as 20e and Beaumont Village Lofts, to make its latest round of kitsch improvements to its exterior. There are plans forming, however, to rebuild the Regal Cinemas’ theater in the Sears space at the far southeasternmost corner of the mall, opposite both Holst projects, which, if done right, could really tie that part of the district together. Also, some good news is finally coming to the corner of NE 10th and Grand, a 12-story mixed-use building is nearing approval for the long vacant half-block. This cursed property has had numerous starts and stops, including the Cascadian Court’s second phase, the 27-story Cascadian condo tower, and Weston’s twice failed 31-story condo then 28-story hotel Cosmopolitan Tower. Now, the city owned parcel looks to be finally getting redeveloped, and is guaranteed this time by public financing. Designed by Lever Architecture and LRS, this new c-shaped 240-unit residential building with ground floor retail will house a combination of market rate and low-income units for Home Forward and the Portland Housing Bureau. The design for the undulating mid-rise is reminiscent of Lever’s earlier Art House project, with a proposed facade that subtly folds in and out, giving added visual interest to the textile-like window, thin-brick, and metal panel pattern. This tapestry will have no problem being woven into the existing urban fabric, with its well proportioned elegance and humble street presence; unfortunately, however, it will be dwarfed by the new double-wide going in just a few blocks away. All of these proposals combined will add roughly 3,000 residential units to the district that has notoriously been a ghost town outside of business hours. 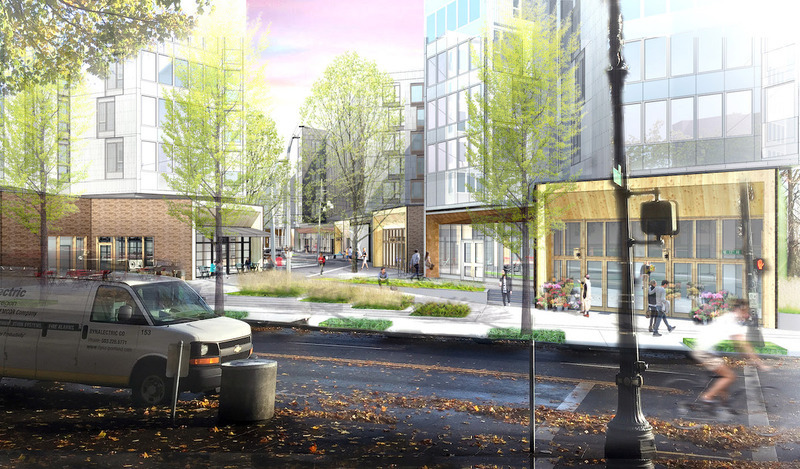 Will this new development actually change the way Portlanders view this once beleaguered neighborhood? To answer plainly, yes, it already has. The success of Hassalo on Eighth proves this kind of change is not only possible, but also profitable. Up until now, the Lloyd’s most unique character trait has been its superblock foundation, but that impassive attribute has been more of a hindrance than an asset to its founders’ envisioned goals. With restrained and calculated architects like GBD rebuilding the Lloyd District’s central axis, and talented design firms like Holst and Lever willing to take chances on the periphery, the area appears to be on its way to becoming yet another great Portland place. Nice work! If any of it drew on my 2015 piece about the Lloyd for BikePortland, which required many hours of reading the Ralph Lloyd papers in PSU’s Ernie Bonner archive, I’d be grateful for a crediting link somewhere. Historic information for this article originally came from a mix of sources, including a story “Vintage Oregon: Who is the ‘Lloyd’ in Lloyd Center?” by Joseph Rose at the Oregonian, the Lloyd District Community Association’s history page, a Metro report on the Lloyd District and Sullivan’s Gulch, and Vintage Portland. The BikePortland article Michael Andersen is referring to is far more robust and insightful (and pre-dates the Oregonian article to boot! ), therefore it has been linked to “as the story goes” in the related Vision II section above. Excellent read if anyone wants more information on the Lloyd District’s history! Thanks very much – I should have remembered that post by Joe. I really appreciate the nice words and link.